A damaged home in the aftermath of Hurricane Maria, in Punta Diamante, Puerto Rico on Sept. 21, 2017. On Monday, Gov. Ricardo Rossello said the majority of federal recovery grants would go toward rebuilding homes and businesses. On Monday, the island's governor announced his plans for the first $1.5 billion of those funds. 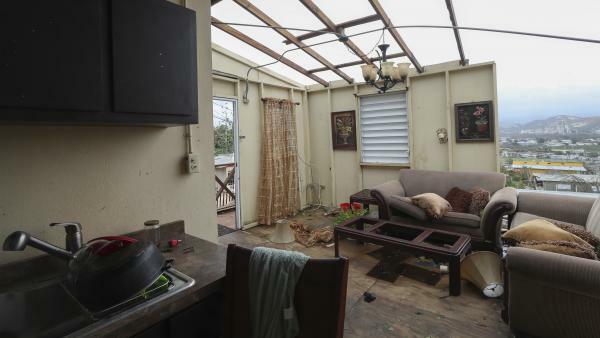 The grants, awarded by the Department of Housing and Urban Development, come with fewer restrictions than what the Federal Emergency Management Agency has spent on the island in the nearly eight months since the storm. Gov. Ricardo Rossello said the majority — at least $817 million — will go to reconstruct damaged single-family homes and businesses. Many of these structures may not have qualified for repair grants under more stringent FEMA requirements. Another $120 million will be made available to finance tax credits used to encourage the construction of low income housing. Efforts to hook homes up to renewable energy sources will get $36 million, and $45 million will be spent to help homeowners behind on their mortgages. Another $12.5 million will provide housing for victims of domestic violence and the homeless. The funds are just a fraction of the roughly $20 billion that HUD has approved to help Puerto Rico recover from the estimated $100 billion in damage caused by Hurricane Maria. Officials are still making plans for the remaining $18.5 billion. Assuming HUD approves the governor's plans for this first installment, funds are expected to start flowing in August.